In 1910 Count Jacques De Lesseps flew from France to England to take the Ruinart and Daily Mail prizes. He had earlier purchased a Blériot XI aircraft from Louis Bleriot who had made the first crossing of the English Channel by a powered aircraft in 1909. 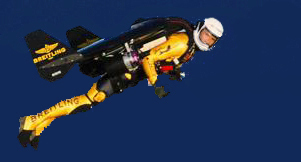 On 21 May 2010, 100 years to the day, Luxembourg aviator Pascal Kramer and Dutch aviator Henk van Hoorn who were both prevented from taking off in 2009, set out to equal the feat in modern replicas, accompanied by the grandson of the original pilot travelling in a helicopter. This DVD tells their story. In the first clip we see Pascal Kremer meeting Mike de Lesseps, preparing the aircraft, take off over the Channel from Calais and crossing the Kent coast in front of Dover Castle to land near St Margarets, close to the field where Jacques landed 100 years previously. The clip ends at the Blériot Memorial site where Blériot landed in 1909. In addition the celebrations of 25th July 2009 are not forgotten. As the mission was not completed in 2009, we waited before releasing this DVD. The events in Dover at the Royal Military School, seafront and White Cliffs are included in an additional film. The French landings made in the early hours of Saturday are shown as is the Swedish aircraft flown by Mikael Carlson the following day. 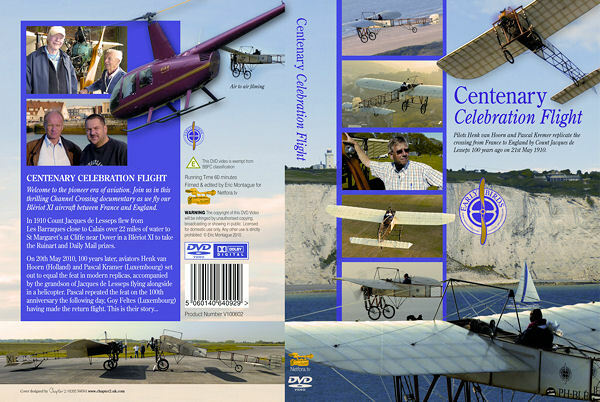 Includes interviews with Mikael and the grandsons of Louis Blériot and Count Jacques de Lesseps, plus the celebrations at the Blériot Monument. Dolby, PAL, Widescreen, running time 61 minutes, including bonus features.